Google’s recent upgrades to Drive have made clear the company's going head-to-head with Microsoft on productivity services. Unfortunately, in its efforts to emulate the industry standard, Google's made its cloud-based apps every bit as Byzantine as Office365. Google's services overlap and their names aren’t self-explanatory. This problem is aggravated by the company’s propensity to change those names, consolidate services under one moniker, or simply discontinue them. Fortunately, underneath the confusing nomenclature you’ll find that Google is currently offering three major productivity services to the public. (While you’ll find dozens of additional products on the company’s master list of products , we aren’t focusing on non-productivity business services like Google AdWords, Google Analytics, Google Payments, and so on in this story.) Here’s an analysis of each to help you decide whether one (or more) is right for you. You can store just about anything on Google Drive (plug-ins let you work directly on Google Drive through Windows and other operating systems), but the real value from a productivity standpoint comes when you use Google’s various business apps, which are integrated directly into Google Drive. Primarily, this includes the trinity of standard business tools: a word processor (Google Docs), a spreadsheet (Google Sheets), and a presentation tool (Google Slides). You can create these documents directly from within Google Drive. You can also upload documents from a device, convert them to the relevant Google format, and continue to edit them online. Some of the confusion over what is basically a straightforward service comes from the colloquial way in which Google Drive is often referenced. 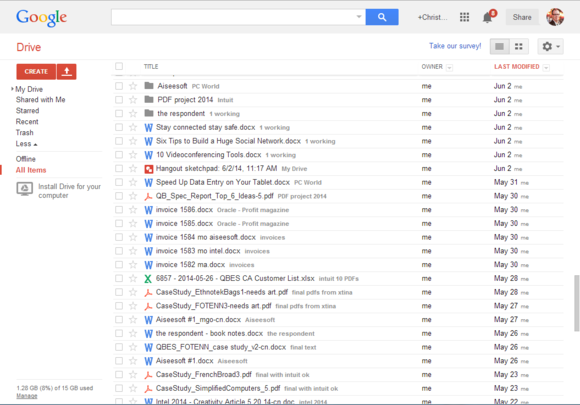 Google Docs existed before Drive, and many users continue to refer to Google Drive by the old Google Docs name. Some are also prone to referring to the system as Google Apps, a term which technically does not describe any official product. Today that’s more of a catch-all term describing a wide range of services and mobile apps that Google develops. Google Drive competes directly with Microsoft OneDrive (formerly Microsoft SkyDrive), which also lets you store all manner of files, as well as create and edit files directly through the service, for free. OneDrive currently gives you 7GB of space for signing up. 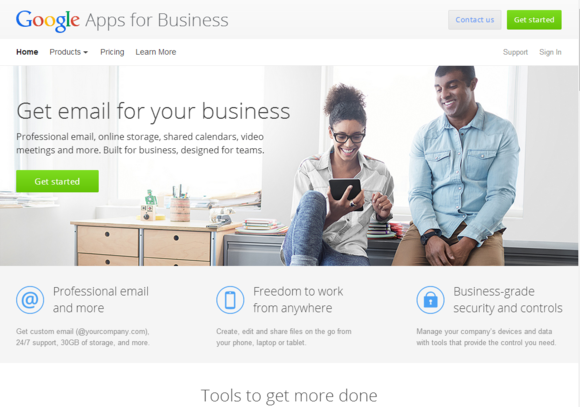 The name Google Apps for Business implies that there is a Google Apps Not for Business, but other than offerings for Education and Government, this isn’t the case. Part of the confusion stems from a prior product called Google Apps Standard, a free and stripped-down version of Google Apps for Business. This was discontinued in 2012, when Google said users outgrew the service too quickly. Google Apps for Business customizes Google's productivity tools for groups. Google Apps for Business comprises a sprawling set of services (customized for use in groups) that includes everything described above under Google Drive, plus some additional tools. Most notable among them is the ability to set up your own email system (with your own domain), shared calendars, and video meetings and presentations via Google Hangouts. Many companies that adopt Google Apps for Business use it heavily for the email features, while the ability to collaborate on document creation and editing is almost an afterthought. Subscribers can manage Google Apps for Business through a central tool, called Google Admin, where you add and delete approved users and devices and perform other basic maintenance. 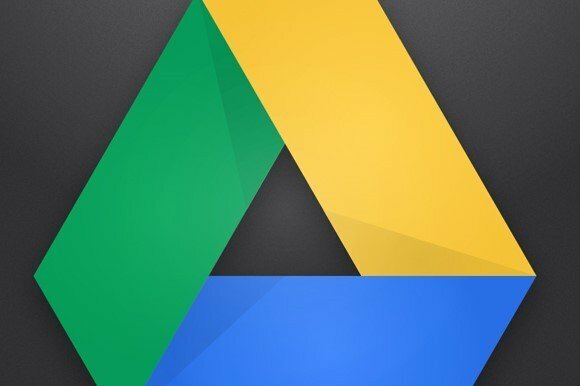 The latest addition to the Google Drive/Apps family is Google Drive for Work, which mostly amounts to an expansion of storage space for customers of Google Apps for Business. The heart of the program is unlimited storage. 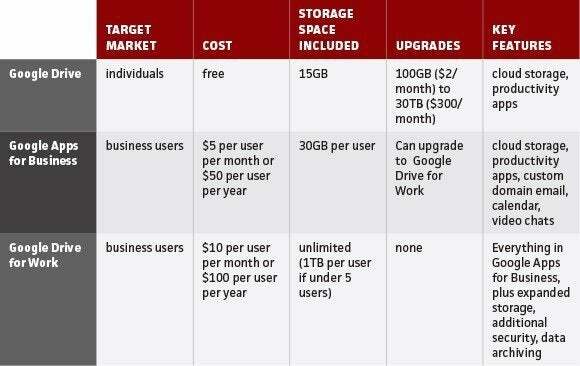 For $10 per user per month (or $100 per user per year), Google lifts the 30GB per user cap. For companies with five or more paid users, there are no limits on the amount of storage space each user occupies, but if you have fewer than five, the cap remains at a spacious 1TB per user. In addition to the expanded storage feature, Google Drive for Work also adds improved security and manageability, such as the power to decide whether users can install the Google Drive Windows client on an individual basis. Google Drive for Work also includes a component called Google Vault (also known as Google Apps Vault), which lets you archive your company’s email and web chat content for the amount of time that you set. This alone could be essential for certain businesses where data retention rules have to be followed. Once you get a handle on Google’s erratic naming scheme, understanding the differences among these offerings ultimately isn’t too tough. One thing’s for sure, though: This will all change again, and sooner than we all think.